When we take our children to a museum, she continued, we should take them to the exhibits that we are dying to see; we should read to them from a plaque because we want to find out more information about that painting. If we take them on a nature walk, we should point out leaves or pontificate on seasons—not because we are trying to teach them—but because we want to share with them the very things that are amazing to us in that moment. In other words, we want to inspire our children to learn by letting them see how much fun we’re having doing it. I’ve decided to make this my Parenting Mantra. It makes inherent sense, and it’s incredibly liberating (down with guilt!). Best of all, it makes parenting immensely more enjoyable. I can sing louder in the car (I’m showcasing my love of music)! I can openly gush about how delicious something tastes! I can save my pennies and indulge my love of travel with my kids by my side! In retrospect, I also realize that this is a huge part of how I’ve always approached reading to my children. I read great books to them, because I love great books. I read to them, because I love cozying up and inhaling the sweetness of their hair. I read to them, because (thanks in large part to the recent serge of phenomenal non-fiction books for kids) I get to learn something new. Every time we open a book together, I get to experience the joy of learning alongside my children. And it’s just so much fun. JP asks a lot of questions. (We’ve been over this.) A lot of these questions are about science, a subject that I never particularly loved in school. Now, as JP’s mom, I really regret that I didn’t pay more attention in science class. I don’t want to say “ask your father” every time a question comes up about science or engineering. Last spring in school, JP undertook a research project about polar bears. One afternoon, he mentioned how he’d read that polar bears were in danger of becoming extinct because of global warming. “But what exactly is global warming?” he asked me. I then tripped over my words, offering a long-winded explanation that revealed only a partial understanding on my part. 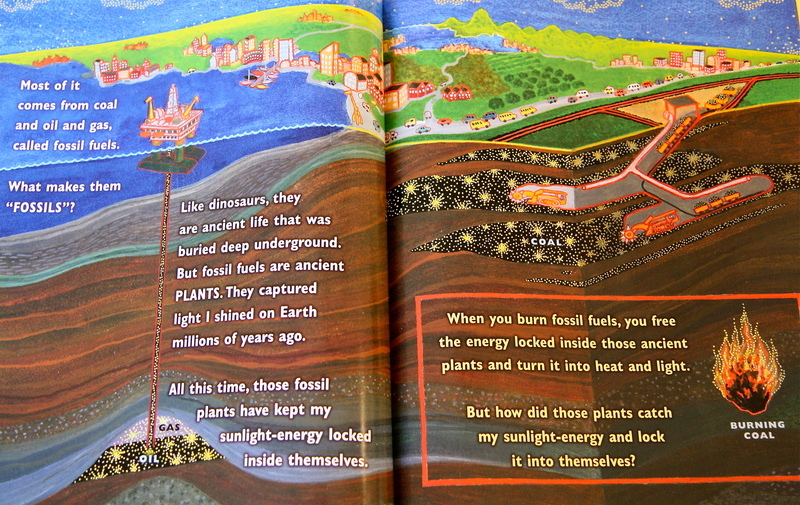 So, when I read Buried Sunlight: How Fossil Fuels Have Changed the Earth (Ages 6-12), the latest offering in Molly Bang and Penny Chisholm’s fascinating Sunlight Series, I was squirming with excitement to have all the right words and all the right pictures to explain global warming. And to understand it finally myself! If you’re not familiar with this luminescent and poetic picture book series about the relationship between sunlight and energy—collaboratively written by an ecology professor (Chisholm) and a children’s author-illustrator (Bang)—this is the fourth title. Invoking the sun as narrator, My Light describes how sunlight is transformed into electricity; Living Sunlight: How Plants Bring the Earth to Life goes on to offer the most accessible explanation of photosynthesis I’ve ever encountered; and Ocean Sunlight: How Tiny Plants Feed the Seas reveals the sun’s vital role in sustaining the life cycles and food chains in our oceans. Now, with Buried Sunlight, we are introduced to fossil fuels: how they were created millions of years ago, how they work, and the effects on our planet of burning them today. I am going to out myself right now and admit that I had no idea fossil fuels are actually “fossilized plants,” buried deep within the earth’s surface long ago, with the sunlight’s energy still locked inside them (in the form of carbon chains). In a matter of speaking, burning fossil fuels—oil, coal, and gas—releases the ancient sunlight’s energy and turns it back into heat and light. All this is well and good, until you consider that unlocking this energy also releases an excess of carbon, challenging the natural balance of oxygen and carbon dioxide that exists in our planet’s air and water systems. Until now, there’s always been a little bit more oxygen created by photosynthesis than necessary; as fossil fuels are more rapidly consumed, the increased carbon dioxide will fight with this oxygen, trapping more heat in our atmosphere, melting glaciers (disrupting the polar bears’ habitats), creating more severe weather, and potentially causing greater problems than we can even imagine. As parents, we will never have all the answers to our children’s questions. But we will always have books. And if beauties like this continue to be published, we will have the great pleasure of unraveling some of the mysteries of the world alongside our children. And, of course, all the amazing picture book biographies of scientists, many mentioned here! Review copy courtesy of Scholastic publishing. Amazon.com affiliate links support my book-buying habit and contribute to my being able to share more great books with you–although I prefer that we all shop local when we can! Wow. Great advice from the teacher and that book sounds perfect as well. Thank you. You are currently reading Learning Alongside Our Children at What to Read to Your Kids.